Structure and Contexts. Routledge Guides to Linguistics. Stumpf, Marianne Rossi (2018). 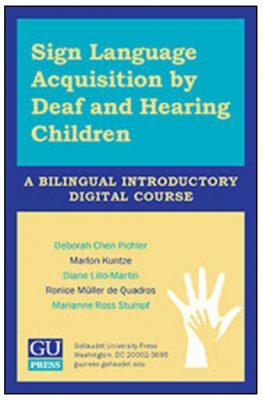 Sign Language Acquisition by Deaf and Hearing Children: A Bilingual Introduction. Gallaudet University Press. Sandl er, Wendy & Lillo-Martin, Diane (2006). Sign Language and Linguistic Universals. Cambridge: Cambridge University Press. Crain, Stephen, & Lillo-Martin, Diane (1999). Linguistic Theory and Language Acquisition. Oxford: Blackwell. Marschark, Marc, Siple, Patricia, Lillo-Martin, Diane, Campbell, Ruth, & Everhart, Victoria S. (1997). 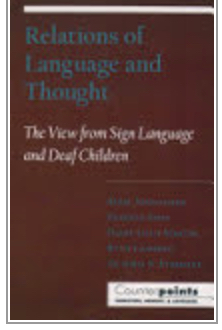 Relations of Language and Thought: The View from Sign Language and Deaf Children. New York: Oxford University Press. Lillo-Martin, Diane (1991). 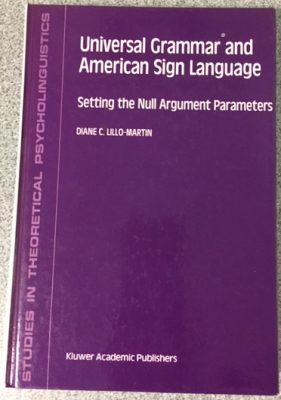 Universal Grammar and American Sign Language: Setting the Null Argument Parameters. Dordrecht: Kluwer Academic Publishers. Where available, click on the title to download a copy of the article. Please see CV for full listing. Goodwin, Corina, Prunier, Lee & Lillo-Martin, Diane (2019). Parental sign input to Deaf children of Deaf parents: Vocabulary and syntax Parental sign input to Deaf children of Deaf parents: Vocabulary and syntax. Proceedings of the Boston University Conference on Language Development (BUCLD) 43. Boston, MA; November 2018. Chen Pichler, Deborah, Lillo-Martin, Diane & Palmer, Jeffrey L. (2018). A short introduction to heritage signers. Special section, guest edited by Deborah Chen Pichler, Sign Language Studies 18.3, 309-327. Chen Pichler, Deborah, Reynolds, Wanette, Palmer, Jeffrey Levi, Quadros, Ronice Müller de, Kozak, Viola Laura & Lillo-Martin, Diane (2017). Heritage signers: Bimodal bilingual children from deaf families. In Jiyoung Choi, Hamida Demirdache, Oana Lungu & Laurence Voeltzel (Eds. ), Language Acquisition at the Interfaces: Proceedings of GALA 2015, 247-269. Newcastle upon Tyne: Cambridge Scholars Publishing. Goodwin, Corina, Davidson, Kathryn & Lillo-Martin, Diane (2017). English Article Use in Bimodal Bilingual Children with Cochlear Implants: Effects of Language Transfer and Early Language Exposure. In Maria LaMendola & Jennifer Scott (Eds. ), Proceedings of the 41st Annual Boston University Conference on Language Development, 283-295. Somerville, MA: Cascadilla Press. Hall, Matthew L., Eigsti, Inge-Marie, Bortfeld, Heather & Lillo-Martin, Diane (2017). Auditory deprivation does not impair executive function, but language deprivation might: Parent-report evidence from deaf native signing children. Journal of Deaf Studies and Deaf Education 22.1, 9-21. Nguyen, Emma, Lillo-Martin, Diane & Snyder, William (2017). Actionality Speaks Louder than Felicity: English-Speaking Children’s Comprehension of Passives. In Jiyoung Choi, Hamida Demirdache, Oana Lungu & Laurence Voeltzel (Eds. ), Language Acquisition at the Interfaces: Proceedings of GALA 2015, 232-246. Newcastle upon Tyne: Cambridge Scholars Publishing. Chen Pichler, Deborah, Hochgesang, Julie, Lillo-Martin, Diane, Quadros, Ronice Müller de & Reynolds, Wanette (2016). Best practices for building a bi-modal bi-lingual bi-national child corpus. Sign Language Studies 16.3, 361-388. Chen Pichler, Deborah & Lillo-Martin, Diane (2016). Nativism. In Genie Gertz & Patrick Boudreault (Eds. ), The SAGE Deaf Studies Encyclopedia, 709-711. Thousand Oaks, CA: SAGE Publishing. Gökgöz, Kadir, Bogomolets, Ksenia, Tieu, Lyn, Palmer, Jeffrey Levi & Lillo-Martin, Diane. (2016). Contrastive Focus in Children Acquiring English and ASL: Cues of Prominence. In Laurel Perkins, Rachel Dudley, Juliana Gerard & Kasia Hitczenko (Eds. ), Proceedings of the 6th Conference on Generative Approaches to Language Acquisition – North America (GALANA 2015), 13-23. Somerville, MA: Cascadilla Proceedings Project. Koulidobrova, Elena & Lillo-Martin Diane (2016). A ‘point’ of inquiry: The case of the (non-) pronominal IX in ASL. In Patrick Grosz & Pritty Patel-Grosz (Eds. ), The Impact of Pronominal Form on Interpretation [Studies in Generative Grammar], 221-250. Berlin: Mouton de Gruyter. Lillo-Martin, Diane, Quadros, Ronice Müller de & Chen Pichler, Deborah (2016). The development of bimodal bilingualism: Implications for linguistic theory. (Invited keynote paper for epistemological issue.) 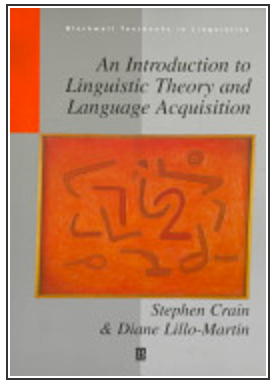 Linguistic Approaches to Bilingualism 6.6, 719-755. Lillo-Martin, Diane, Quadros, Ronice Müller de & Chen Pichler, Deborah (2016). Synthesizing Commentaries and Responses. (Response to commentaries on keynote paper.) Linguistic Approaches to Bilingualism 6.6, 839-848. Quadros, Ronice Müller de, Lillo-Martin, Diane & Chen Pichler, Deborah (2016). Bimodal Bilingualism: Sign Language and Spoken Language. In Marc Marschark & Patricia Elizabeth Spencer (Eds. ), The Oxford Handbook of Deaf Studies in Language: Research, Policy, and Practice, 181-196. Oxford, UK: Oxford University Press. Quadros, Ronice Müller de, Lillo-Martin, Diane & Emmorey, Karen (2016). As línguas de bilíngues bimodais. Revista de Estudos Linguísticos da Univerdade do Porto 11, 139-160. Gökgöz, Kadir, Quadros, Ronice Müller de, Oliveira, Janine & Lillo-Martin, Diane (2015). Pointing and Eyegaze in Bimodal Bilingual Language Development. In Elizabeth Grillo and Kyle Jepson (Eds. ), Proceedings of the Boston University Conference on Language Development (BUCLD) 39, 178-190. Somerville, MA: Cascadilla Press. Quadros, Ronice Müller de, Chen Pichler, Deborah, Lillo-Martin, Diane, Cruz, Carina Rebello, Kozak, Laura, Palmer, Jeffrey Levi, Lemos Pizzio, Aline & Reynolds, Wanette (2015). Methods in bimodal bilingualism research: Experimental studies. In Eleni Orfanidou, Bencie Woll & Gary Morgan (Eds. ), The Blackwell Guide to Research Methods in Sign Language Studies, 250-280. Blackwell. Chen Pichler, Deborah, Lee, James, & Lillo-Martin, Diane (2014). Language Development in ASL-English Bimodal Bilinguals. In David Quinto-Pozos (Ed. ), Multilingual Aspects of Signed Language Communication and Disorder, 235-260. Bristol, UK: Multilingual Matters. Quadros, Ronice Müller de, Lillo-Martin, Diane & Chen Pichler, Deborah (2014). Methodological considerations for the development and use of sign language acquisition corpora. In Tommaso Raso & Heliana Mello (Eds. ), Spoken Corpora and Linguistic Studies, 84-102. Amsterdam: John Benjamins. Lillo-Martin, Diane (2013). Insights from Japanese Linguistics for the Study of Sign Languages. In Yoichi Miyamoto, Daiko Takahashi, Hideki Maki, Masao Ochi, Koji Sugisaki & Asako Uchibori (Eds. ), Deep Insights, Broad Perspectives: Essays in Honor of Mamoru Saito, 257-274. Tokyo: Kaitakusha. Meier, Richard P. & Lillo-Martin, Diane (2013). The Points of Language. Humana.mente: Journal of Philosophical Studies 24, 151-176. Special issue on Pointing, Massimiliano L. Cappuccio (Ed.). Quadros, Ronice Müller de, Lillo-Martin, Diane & Chen Pichler, Deborah (2013). Early Effects of Bilingualism on WH-Question Structures: Insight from Sign-Speech Bilingualism. In Stavroula Stavrakaki, Marina Lalioti & Polyxeni Konstantinopoulou (Eds. ), Proceedings of GALA 2011, 300-308. Newcastle upon Tyne: Cambridge Scholars Press. Lillo-Martin, Diane (2012). Utterance Reports and Constructed Action in Sign and Spoken Languages. In Roland Pfau, Markus Steinbach, & Bencie Woll (Eds. 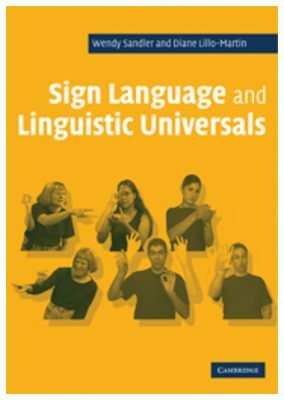 ), Sign Language – An International Handbook, 365-387. Berlin: Walter de Gruyter. Lillo-Martin, Diane, Koulidobrova, Helen, Quadros, Ronice Müller de & Chen Pichler, Deborah (2012). Bilingual Language Synthesis: Evidence from WH-Questions in Bimodal Bilinguals. In Alia K. Biller, Esther Y. Chung, & Amelia E. Kimball (Eds. ), Proceedings of the 36th Annual Boston University Conference on Language Development, 302-314. Somerville, MA: Cascadilla Press. Meier, Richard P. & Lillo-Martin, Diane (2012). Response: The apparent reorganization of gesture in the evolution of verb agreement in signed languages. Theoretical Linguistics 38, 153-157. Quadros, Ronice Müller de, Lillo-Martin, Diane & Chen Pichler, Deborah (2012). Bi-National Bi-modal Bi-Lingual Corpora of Child Language. In Heliana Mello, Massimo Pettorino & Tommaso Raso (Eds. ), Proceedings of the VIIth GSCP [Gruppo di Studi sulla Comunicazione Parlata] International Conference: Speech and Corpora, 87-92. Firenze: Firenze University Press. Lillo-Martin, Diane (2011). Sign Languages. In Patrick Colm Hogan (Ed. ), The Cambridge Encyclopedia of the Language Sciences, 774-777. Cambridge: Cambridge University Press. Lillo-Martin, Diane & Meier, Richard P. (2011). Response to Commentaries: Gesture, Language, and Directionality. Theoretical Linguistics 37, 235-246. Quadros, Ronice Muller de, Lillo-Martin, Diane & Chen Pichler, Deborah (2011). Desenvolvimento Bilíngue Intermodal: Implicações para Educação e Interpretação de Línguas de Sinais. In: Maria Cecilia de Moura, Sandra Regina Leite de Campos & Sabine Antonialli Arena Vergamini (Eds. ), Educação para Surdos: Práticas e Perspectivas II, v. 1, 1-14. São Paulo: Santos Editora. Snyder, William & Lillo-Martin, Diane (2011). Principles and Parameters Theory and Language Acquisition. In Patrick Colm Hogan (Ed. ), The Cambridge Encyclopedia of the Language Sciences, 670-673. Cambridge: Cambridge University Press. Best, Cathi, Mathur, Gaurav, Miranda, Karen, & Lillo-Martin, Diane (2010). Effects of Sign Language Experience on Categorical Perception of Dynamic ASL Pseudosigns. Attention, Perception, & Psychophysics 72(3), 747-762. Chen Pichler, Deborah, Hochgesang, Julie, Lillo-Martin, Diane & Quadros, Ronice Müller de (2010). Conventions for Sign and Speech Transcription in Child Bimodal Bilingual Corpora in ELAN. Language, Interaction and Acquisition / Langage, Interaction et Acquisition 1(1), 11-40. (PMCID: PMC3102315). Hochgesang, Julie, Pascual Villanueva, Pedro, Mathur, Gaurav, & Lillo-Martin, Diane (2010). Building a Database While Considering Research Ethics in Sign Language Communities. Proceedings of the 4th Workshop on the Representation and Processing of Sign Languages: Corpora and Sign Language Technologies; 7th Language Resources and Evaluation Conference. Lillo-Martin, Diane, Quadros, Ronice Müller de, Koulidobrova, Helen & Chen Pichler, Deborah (2010). Bimodal Bilingual Cross-Language Influence In Unexpected Domains. In João Costa, Ana Castro, Maria Lobo & Fernanda Pratas (Eds. ), Language Acquisition and Development: Proceedings of GALA 2009, 264-275. Newcastle upon Tyne: Cambridge Scholars Press. Lillo-Martin, Diane & Snyder, William (2010). Commentary on “Syntax at Age Two.” Language Acquisition 17:1/2, 66-69. Meier, Richard P. & Lillo-Martin, Diane (2010). Does Spatial Make it Special? On the Grammar of Pointing Signs in American Sign Language. In Donna B. Gerdts, John C. Moore, & Maria Polinsky (Eds. ), Hypothesis A/Hypothesis B: Linguistic Explorations in Honor of David M. Perlmutter, 345-360. Cambridge, MA: MIT Press. Quadros, Ronice Müller de & Lillo-Martin, Diane (2010). Clause Structure. In Diane Brentari (Ed. ), Sign Languages: A Cambridge Language Survey, 225-251. Cambridge: Cambridge University Press. Quadros, Ronice Müller de & Lillo-Martin, Diane (2010). Sign Language Acquisition and Verbal Morphology in Brazilian and American Sign Languages. In Leonor Scliar-Cabral (Ed. ), Psycholinguistics: Scientific and Technological Challenges (Selected papers of the 8th International Congress of the International Society of Applied Psycholinguistics), 252-262. Porto Alegre, Brazil: EdiPUCRS. Quadros, Ronice Müller de, Lillo-Martin, Diane & Chen Pichler, Deborah (2010). Desenvolvimento bilíngue intermodal. Anais do IX Congresso Internacional de Educação de Surdos, 146-150. Instituto Nacional de Educação de Surdos. Rio de Janeiro. Lillo-Martin, Diane (2009). Sign Language Acquisition Studies. In Edith Bavin (Ed. ), The Cambridge Handbook of Child Language, 399-415. Cambridge: Cambridge University Press. Lillo-Martin, Diane & Quadros, Ronice Müller de (2009). Imperativos Análogos a Raízes Infinitivas: Evidência das Línguas de Sinais Americana e Brasileira. (Imperatives function as analogues to root infinitives: Evidence from ASL and LSB). Cadernos de Saúde, Numero Especial de Línguas Gestuais, 29-35. Lillo-Martin, Diane & Snyder, William (2009). Commentary on “Capturing the Evasive Passive.” Language Acquisition 16, 118-122. Lillo-Martin, Diane & Chen Picher, Deborah (2008). Development of Sign Language Acquisition Corpora. In Onno Crasborn, Eleni Efthimiou, Thomas Hanke, Ernst D. Thoutenhoofd, & Inge Zwitserlood, (Eds. 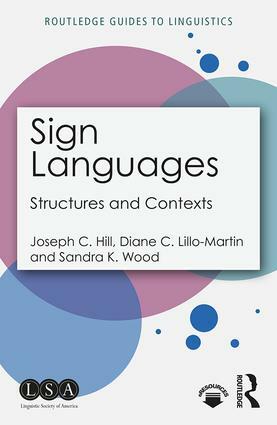 ), Proceedings of the 3rd Workshop on the Representation and Processing of Sign Languages: Construction and Exploitation of Sign Language Corpora; 6th Language Resources and Evaluation Conference, 129-133. http://www.lrec-conf.org/proceedings/lrec2008/workshops/W25_Proceedings.pdf. Lillo-Martin, Diane (2008) Sign Language Acquisition Studies: Past, Present and Future. In Ronice Müller de Quadros (Ed. ), Sign Languages: Spinning and unraveling the past, present and future. TISLR9, forty-five papers and three posters from the 9th Theoretical Issues in Sign Language Research Conference, Florianópolis, Brazil, December 2006, 244-263. Petrópolis, Brazil: Editora Arara Azul. http://www.editora-arara-azul.com.br/EstudosSurdos.php. Lillo-Martin, Diane & Quadros, Ronice Müller de (2008). Focus Constructions in American Sign Language and Língua de Sinais Brasileira. In Josep Quer (Ed. ), Signs of the Time: Selected Papers from TISLR 2004, 161-176. Seedorf, Germany: Signum Verlag. Lillo-Martin, Diane & Snyder, William (2008). Commentary on “The Acquisition of Inflection: A Parameter-Setting Approach.” Language Acquisition 15, 210-215.